« Cary’s Best Games of 2018 Awards Show! Capcom’s Ghosts N Goblins series of 2-D platformers have gained quite a reputation for being super difficult and brutal, but they also have quite a following, too. Which is strange considering they haven’t made a new game in the series in ages. But if you’ve got an urge to play a Ghosts N Goblins style game, Battle Princess Madelyn may scratch that itch. It really almost looks like something Capcom would’ve made for the Super Nintendo back in the 16-bit days. Which is both an honor and a blessing, but also a curse as well. It’s available to download for nearly all current game consoles and PC, but reviewed on PS4 here. The game has two main modes: Arcade Mode and Story Mode. In the story, a grandfather is reading a story to his sick granddaughter, and you play the part as the main character in the story. When a demon zaps the royal family and their pet, Princess Madelyn dons armor and weapons to fight back. Her dog joins her, too, as a ghost, and helps her collect MP, attack enemies, and solve puzzles, although they don’t explain how that works in the game very well. The story mode is less linear and has characters to talk to and areas to backtrack to so you can collect different weapons, armor, and other goodies. The difficulty is a bit more forgiving in this mode, but not by much. Which is unfortunate because the goals and objectives are oftentimes unclear and even early on it’s hard to know where to go and what to do sometimes. They certainly got the feel of a 16-bit game right, though. It feels like something I would’ve rented back in the day. If you enjoy super hard 2-D platformers and Ghosts N Goblins games, you’ll definitely enjoy this. But the extreme difficulty and lack of clear goals and instructions kept me from getting into it myself. Battle Princess Madelyn is rated E for Everyone with an ESRB descriptor of Mild Fantasy Violence. When you hit enemies, they explode into pixelly pieces. When you get hit, you just get knocked back a bit and fall on your back. 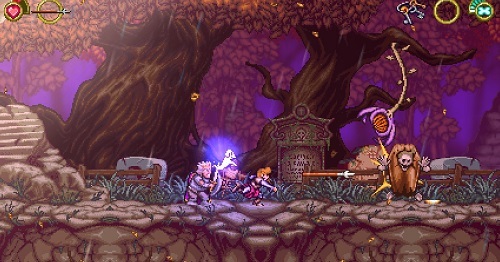 And the story mode shows Princess Madelyn’s dog getting zapped. Younger gamers and less experienced players may find the game too difficult, though. I have to admit, I’m interested in this.